Sony Music chiefs have escaped Anti Social Behaviour Orders (ASBO) after promising not to commission any more illegal fly posting. North London's Camden Council took the unprecedented action after receiving more than 1,000 residents' complaints. But on Monday, action against Catherine Davies and Jo Headland was withdrawn at Highbury Corner Magistrates' Court. 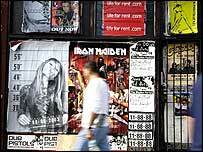 Another music company, BMG, could still face prosecution as it has not pledged to stop ordering fly posting. Since the summonses were issued two weeks ago, fly-posting has largely dried up in the borough. The council claims that Sony and BMG jointly save more than £8m in advertising costs through fly posting on everything from shop hoardings to pillar-boxes in the borough. The council estimates that dealing with illegal fly posting costs the Borough's taxpayers around £250,000 a year. Fly posting has been defined as causing "harassment, alarm or distress" - the criteria required to gain an order. And Richard Gruet, Camden Council's head of litigation, said after Monday's hearing at Highbury Corner Magistrates' Court: "Anti-social behaviour is anti-social behaviour, whoever engages in it. "We have won an undertaking from Sony to the effect that they will not engage in fly-posting any more in this country. We welcome that. "But I think it is a little unfortunate that BMG, who were given the opportunity to do the same undertaking in the same terms, have not done so - that gives us little choice but to pursue them in the courts very shortly." A summons against BMG executive Lucy Hansford was withdrawn only because she is leaving the company in a week's time. Mr Gruet said he had also spoken to Islington, Hastings and Greater Manchester Councils who are interested in taking similar tough action because there are close links between grime and crime levels.